Managing your finances can be overwhelming, and $tand By Me® gives you the tools to take control of your financial future. There are no hidden fees or sales pitches. Our coaches are committed to your success and well-being. 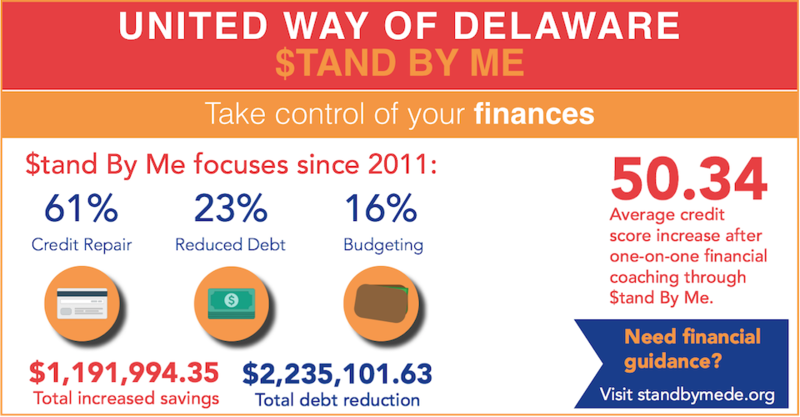 $tand By Me® offers free one-on-one support to Delawareans who want to understand more about their money, make good financial decisions, and enjoy choices for savings and loans. Make an appointment today with a coach and start taking control of your finances. A personal financial coach can work with you to reach your goals of better credit, savings money management, taxes, education, homeownership and more. We can help you understand your monthly income and expenses, so that these amounts match up. You and your coach can review your credit report and find ways to improve your credit score. We’ll help you develop a financial plan that meets your needs. We work with financial institutions who offer consumer-friendly financial services. We have custom-designed savings, Visa/MasterCard debit cards and loan products. We can also help you to compare all the offerings of banks and credit unions to get the ones that work best for you. We work with a variety of community partners and can make referrals for specific services such as debt consolidation, free tax preparation, counseling for home ownership or foreclosure prevention, investments and more.